Everyone expects to lose some sharpness and accuracy in their vision as they age. It’s simply a normal part of life. But not all vision loss is benign. Some people will experience a serious ocular condition known as Keratoconus, which causes permanent damage to the cornea and makes even the simplest of everyday tasks very difficult. Read on to learn more about what causes Keratoconus and how you can protect your eyes from this debilitating condition. In healthy eyes, light enters through the cornea, the clear, domed surface that stretches across the front of the eye and allows it to focus light. Keratoconus causes the cornea to thin, warp, and bulge outward in the shape of a cone, causing your vision to blur and fade. Most people begin to notice the symptoms of Keratoconus in their early adulthood, but they typically grow much worse with age. Some people also notice an increased sensitivity to bright lights, while others see ghost-like, undefined shapes in their vision. 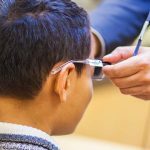 Since your eyes increasingly struggle to properly focus individual rays of light, everyday tasks like driving, reading, and playing sports can seem difficult if not impossible. Although doctors have not yet identified the exact cause of Keratoconus, the condition generally appears to be passed down through families. According to studies, one in 10 people with Keratoconus have a parent who also suffers from the condition. For this reason, many researchers believe that a family history is the primary risk factor for Keratoconus. Various studies have shown that corneas affected by Keratoconus are missing some of the fibrils that normally stabilize the anterior cornea, which causes the cornea to swell forward. Healthy eyes have a defense system in place to neutralize harmful free radicals produced by normal cell metabolism, preventing them from doing damage to the collagen. Corneas affected by Keratoconus usually lack this essential system. Over time, this can result in severe damage to the collagen of the cornea. This genetic predisposition toward Keratoconus can be intensified by a wide range of environmental and medical factors. Many people with Keratoconus report eye itching, irritation, and rubbing caused by allergies. Clearly, however, not everyone with seasonal allergies and eye rubbing habits will develop this degenerative condition. Although eye doctors have debated what causes Keratoconus for years, researchers have yet to determine a single conclusive cause. The most likely explanation is that a genetic tendency to develop Keratoconus is exacerbated by bad habits and secondary medical issues. Specialized contact lenses and advanced treatment methods can help prevent further damage to the cornea. 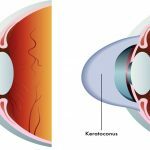 After reading through this article, we hope that you have a more comprehensive understanding of what causes Keratoconus. If you have vision problems and believe that you may have Keratoconus, please contact the experienced eye care professionals at the office of Dr. Barry Leonard. Not only is Dr. Leonard the area’s most trusted Keratoconus doctor, he also has Keratoconus, and knows first-hand what you are experiencing. We can perform a thorough eye exam, present your treatment options, and work hard to protect your eyes from further damage. To get in touch with our team, please call 818-891-6711 today!